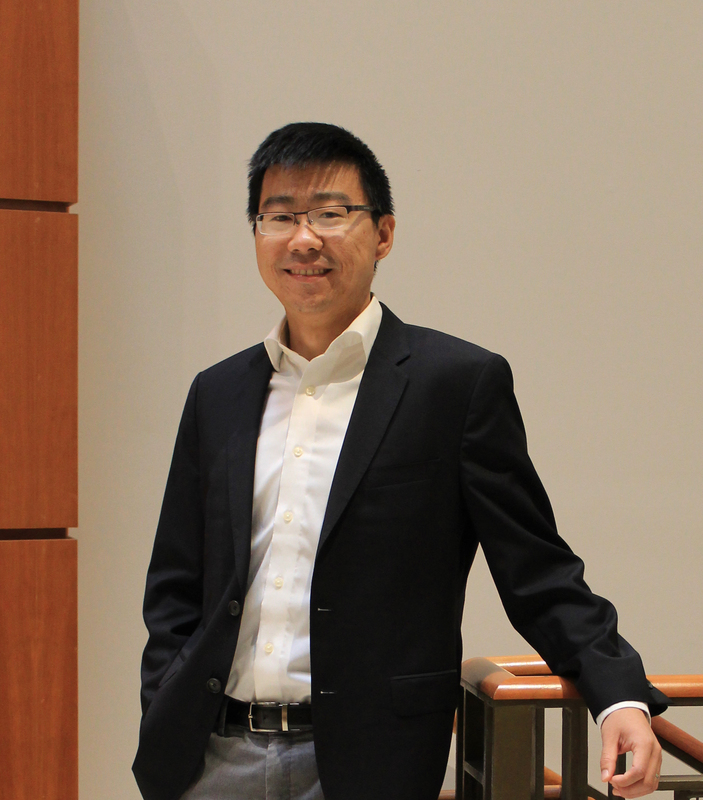 Davidson School of Chemical Engineering assistant professor Letian Dou and a multi-institution team of researchers have recently published a paper in Nature Materials. The article, "Thermochromic halide perovskite solar cells," focuses on the team's research of the structural phase transition behaviors in mixed halide perovskite CsPbI3-xBrx thin films. The phase transitions result in solar cell films with two switchable characteristic states, each having distinct visible transparencies and photovoltaic device efficiencies. These films are expected to be useful in the development of smart photovoltaic windows. Davidson School of Chemical Engineering assistant professor Letian Dou and a multi-institution team of researchers have recently published a paper in Nature Materials. The article, “Thermochromic halide perovskite solar cells,” focuses on the team’s research of the structural phase transition behaviors in mixed halide perovskite CsPbI3-xBrx thin films. The phase transitions result in solar cell films with two switchable characteristic states, each having distinct visible transparencies and photovoltaic device efficiencies. These films are expected to be useful in the development of smart photovoltaic windows. In addition to Dou from Purdue University, the team includes researchers from the Departments of Chemistry and Materials Science and Engineering, University of California-Berkeley; the U.S. Department of Energy’s Lawrence Berkeley National Laboratory, Berkeley, CA; Shanghai University of Electric Power, Shanghai, China; Berzelii Center EXCELENT on Porous Materials, Stockholm University, Stockholm, Sweden; Lawrence Livermore National Laboratory, Livermore, CA; and Kavli Energy NanoScience Institute, Berkeley, CA. In this work, Dou contributed to the design of the device architecture and the phase transition dynamics study. The work was primarily done during Dou’s transition from Berkeley to Purdue University. Other major contributors of this work include Professor Peidong Yang, Dr. Jia Lin, and Mr. Minliang Lai at Berkeley Lab. Smart photovoltaic windows represent a promising green technology, with practical integrated applications in buildings, automobiles, information displays, and many other technologies. Current semi-transparent photocells are effective in providing light, shade, and power output, but these photocells do not have any color-changing characteristics. Smart photovoltaic windows, as researched by the team, provide all of the same aspects as semi-transparent photocells, and also allow switchable transparencies that harvest and manage incoming solar energy. The solar cells undergo reversible transitions which are thermally driven (150 ~ 200 °C) and moisture mediated. 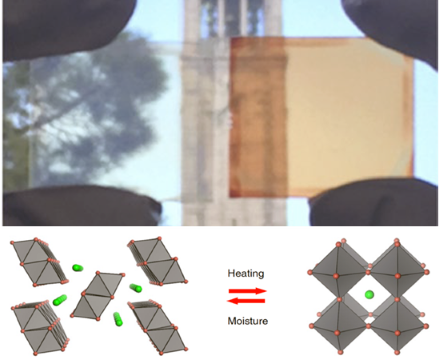 Researchers found the cells transition between a transparent, non-perovskite phase with 81.7% visible transparency and a low power output to a deeply colored perovskite phase with a reduced transparency of 35.4% and a high power output. The solar cell features high thermal stability and fully reversible color and performance, both of which are key requirements for successfully integrating the cells into diverse applications. A similar concept was reported by a U.S. Department of Energy National Renewable Energy Laboratory (NREL) group using organic-inorganic perovskites. The device switching mechanism, shared in a recent press release, is based on chemical decomposition and reformation of the perovskite materials.